Hyundai Motor India Limitedintroduced the original i20 in the year 2008 and it turned out to be a good seller soon. But as competition tightened up, the company decided to blow in some more charm to the i20. It brought out an improved and trendier version of the i20 – the Elite i20. True to its name, the new car is an elite package with some new equipment and features. Let us take a closer look on the same. Hyundai’s fluidic sculpture design is clearly manifest in the new i20. The low set hexagonal grille flanked by chrome detailed swept back headlamps along with a flat bonnet instantly captures the onlooker’s attention. The overall length has been slightly reduced now, but the wheelbase is widened significantly. The blackened C pillar gives the car a distinct look. The boot is placed rather high from the ground, yet nothing much to complain about. The Hyundai Elite i20 interiors cabin is roomy and the layered dashboard with a hi-tech information cluster and leather wrapped 3 spoke multi-function steering wheel gives an upmarket feel. The extended wheelbase makes the cabin more spacious and 5 adults can sit incomfortably. The 285 litres of boot space ensures a decent share of luggage. In addition, there are front and rear door map pockets, front passenger seat back pockets, rear parcel tray, sunglass holder and similar small storage spaces throughout the cabin. The higher end models come with a fully automatic AC with rear vents, engine start/stop button, integrated 2 Din MP3 Audio with USB, Aux-in, Bluetooth connectivity and 1 GB internal memory. Safety features include immobilizer, smart keyless entry, rear parking sensors with camera, central locking, seat belt pretensioners, dual front airbags, automatic headlamps, impact sensing auto door unlock and clutch lock. The mechanics under the hood has remained more or less the same as that of original i20. The Elite i20 is equipped by a refined 1.4-litre U2 CRDI diesel engine with power and torque output of 89 bhp and 220 Nm at 1500 RPM. This engine comes mated to a six-speed manual gearbox. The second unit is the reliable 1.2-litre 4cylinder VTVT Kappa petrol engine which churns out a maximum power output of 82bhp and torque of 115 Nm at 4000RPM. The diesel and petrol engines promise a fuel efficiency of 21.76 kmpl and 18.6 kmpl respectively. The drive in an Elite i20 is not so exciting, but is a comfortable one for sure. The light steering makes parking easy, the suspension is absorbent and even noise levelsare very well contained. The peppy engine proves to be sufficiently fuel efficient as well. 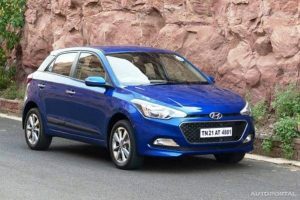 Hyundai offers Elite i20in the price range of Rs. 4.99 lakhs to Rs. 7.66 lakhs.